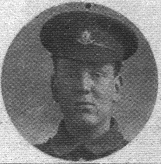 A chum of the deceased says: “Charlie was liked by all, not only in the company, but by everyone in the battalion and was very much respected by the platoon officer. His death was instantaneous.” When he was in Worcester he was billeted in Vincent Road and known as “Tiny”. Pont-du-Hem was in German hands from mid-April to mid-September, 1918. The Cemetery in which Clarles Hammond is now buried was begun, in an apple-orchard, in July, 1915, and used until April, 1918, by fighting units and Field Ambulances; these original burials are in Plots I, II and III, and Rows A and B of Plot IV. In April and May, 1918, German burials were made in Plots III and IV. After the Armistice, 426 German graves were removed to other cemeteries; 1st Portuguese graves of 1917-1918 were removed to the Portuguese cemetery of Richebourg-L’Avoue; and British graves were brought in from smaller burial grounds and from the surrounding battlefields.